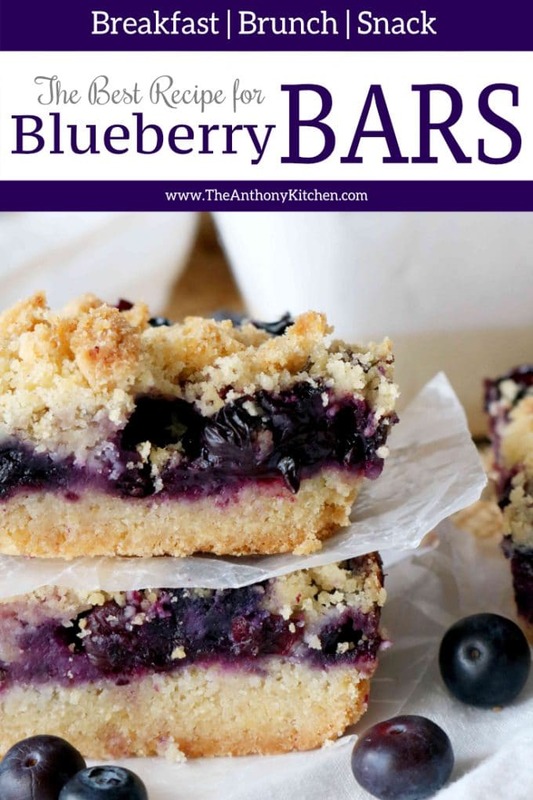 Make the best blueberry bars in the world with this simple and easy recipe! Perfect for mornings on the go, brunches, snack-time, and more. It seems most women completely swoon for fruit. Fruit salads and fruit platters have been a guaranteed hit at every women’s event I’ve ever hosted. If only I could get on board. I often wondered if it’s because just maybe they actually resist the desire to nosh on sweet, carby goodness at any given moment, but rather choose their indulgent moments with care. And if this is the case, perhaps they are left with no other choice than to get their fix, straight from mother nature’s candy. I can’t help but wonder what that’s like. You see, unfortunately, I’m far choosier when it comes to fruit. Not so much dessert. However, I must admit, these days I’ve been on quite a blueberry kick — eating them for breakfast, snacks, and just about everything in between. Although, in order for myself to truly enjoy them, they must meet the following criteria: They must be plump, have a fine balance of sweet and tart, and no (and I mean no) mushy berries allowed. Recently, we went on a family trip, and sadly a giant box of blueberries was left behind. If you know blueberries, you know those members of the berry family are downright finicky and don’t necessarily like to stick around for all that long. In fact, by the time we got back from our four-day trip, the blueberries were softened, and right there on the verge of going bad. What to do, what to do? Seemed like as good a time as any to bake. In all fairness, baking is my solution to a lot of things. But, in the case of these blueberries, it was a perfectly fitting one. The splended combination of fruit and sweet carby goodness. One that any woman (or man) would absolutely swoon over. When I set off on a mission to bake up a batch of delicious blueberry bars, I took notice that almost all of the recipes I was reading through contained a whole lot of sugar. Like, a lot. And, while I’m certainly not known for my uber healthy habits, I know a disproportionate recipe when I see one. 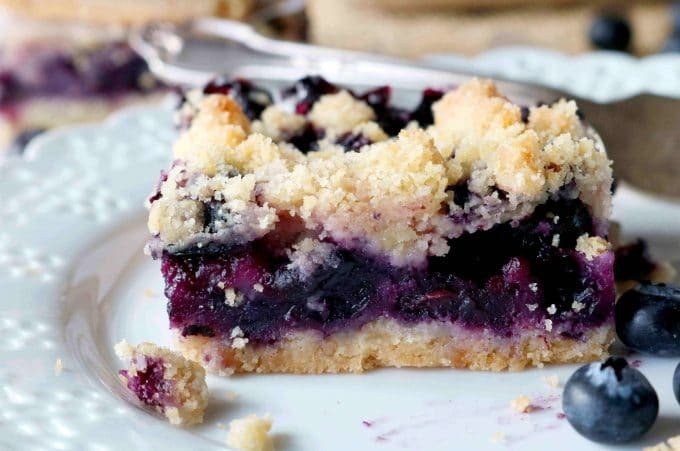 On the bright side, the makeup of blueberry bars was just as I had suspected, a pastry-type crust, a sweet center comprising of blueberries, topped off with a crumble of more pastry. The first go-round, I cut back on the sugar pretty significantly in comparison to recipes I had studied, but even still, the bars were way too sweet, masking the flavor of the blueberries and completely dominating the flavor profile of the bars in general. Rest assured, this was not going to be the case with our blueberry bars. 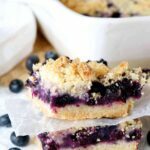 These blueberry bars took no time at all to make, and they’re an easy breakfast treat/snack that can be whipped up with very minimal effort. They begin with a simple, homemade dough. The dough for our blueberry bars consists mostly of flour, sugar, butter, and shortening. If you’ve ever made a homemade pie crust using the food processor method, then you know how seriously fast it is to throw one together. However, if you don’t have a food processor, this recipe is still completely manageable, you’ll just be sure to have a pastry blender handy. 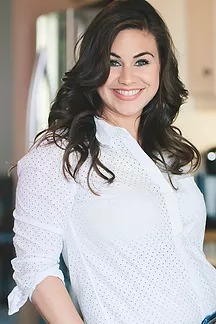 In addition to the flour and fats, the dough also calls for an egg, which helps the dough to stay together, baking powder (a levener), along with vanilla and salt for added flavor. The blueberry filling is a matter of dumping ingredients together and tossing them around. See? Told ya these bars were easy. It consists of blueberries, sugar, salt, lemon juice, zest, and cornstarch. 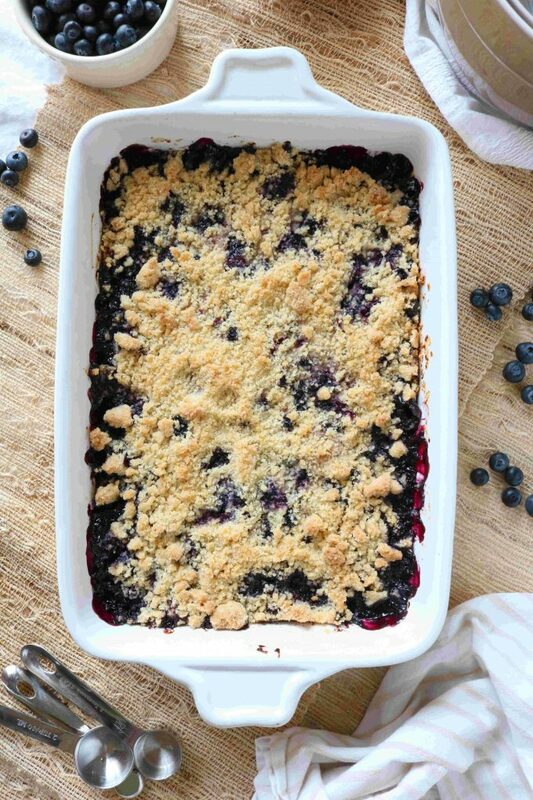 The cornstarch and sugar meld with the blueberries to create a flavorful filling that holds together perfectly. Don’t skip out on the lemon, especially if you’re using ripe blueberries. The lemon adds a very necessary burst of acid to the blueberry bars, and heightens the overall flavor profile. Once the crust comes together, the majority of it gets transferred to a 9×13″ casserole dish. Be sure to leave some for the topping though! The bottom portion is gently patted down to create a solid layer of dough. Then, the blueberry mixture is poured over the solid layer of dough, and the dough that remains is crumbled over the top. The blueberry bars are off to the oven, and baked up until the filling is a beautiful, bubbly mess, and the crust is a perfect golden brown. Even if you are one of those lovely, precious women who just adore their fruit, I must insist you give these a try. They’re the perfect combination of bright fruit flavor, in conjunction with sweet carby goodness. But, like I said before — definitely not too sweet. 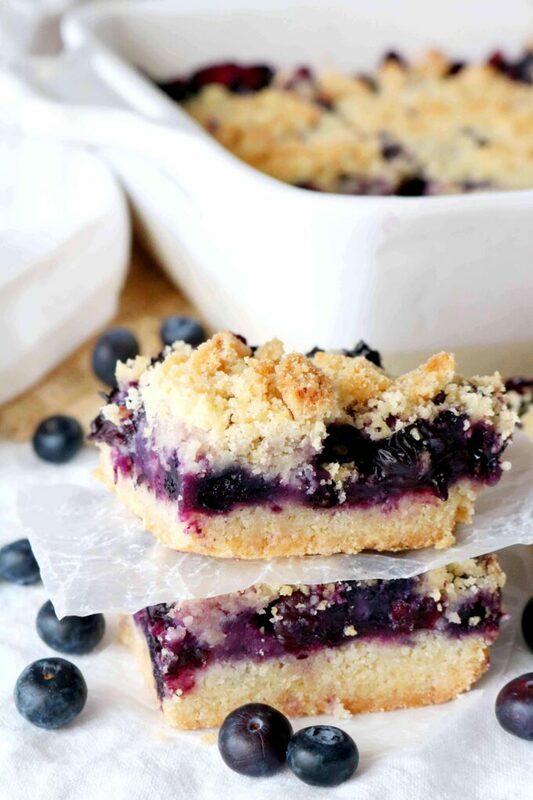 These blueberry bars are perfectly balanced and make for one heck of a breakfast treat. In fact, they’re ideal for those crazy mornings, when you just gotta grab something and go. Plus, they’re freezer friendly. See? With these blueberry bars, the perks just keep on’a coming. Please, enjoy. Easy to make blueberry bars featuring a fresh blueberry filling with lemon, and a simple pastry dough. Position rack in the lower third of the oven, and preheat oven to 375°. Have ready a greased, 9x13" baking dish. Add the flour, sugar, salt, and baking powder to the bowl of a food processor fitted with a paddle attachment. Pulse to mix. If you do not have a food processor, use a large mixing bowl and a whisk. Add the cold, cubed butter and shortening and pulse until the mixture resembles small peas speckled throughout the dry ingredients. Or, you could use a pastry cutter to cut in the fats. Add the egg and vanilla, and pulse combine. If you're not using a food processor, stir with a wooden spoon until evenly incorporated. Set aside until ready to use. In a large mixing bowl, combine blueberries, sugar, cornstarch, lemon zest, lemon juice, and salt. Stir to combine. Add about 2/3's of the dough to the bottom of the greased casserole dish. Gently use your hands to pat the dough out evenly across the dish. Pour the blueberry filling evenly across the dough, and crumble the dough that remains over the top. Bake for 45 minutes, or until the crust is golden-brown. Place on a wire rack and allow to cool 15 minutes before cutting. Serve and enjoy. 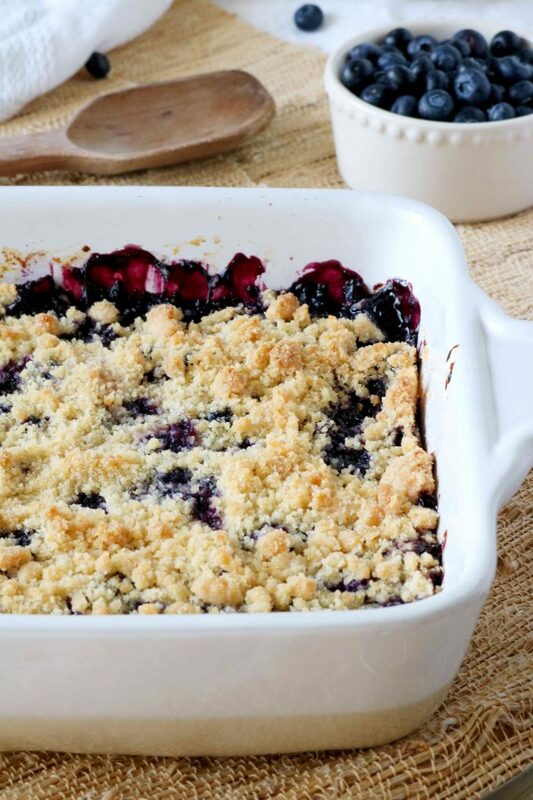 I love how you make the blueberries really shine in this, awesome recipe! No worries 😉 This is a judgment-free zone! Blueberry and lemon is one of those flavour marriages made in heaven, I think, so I know I’d adore these lovely bars. They look so good!